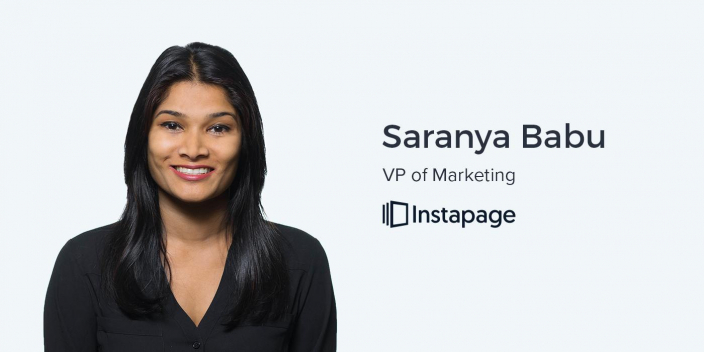 Saranya Babu is a product and technical marketing expert who is currently using her talents as the VP of Marketing at Instapage. Her career began as a software engineer and quickly transformed into product marketing as she developed an affinity specifically working with customers and partners. As a product marketer with B2B SaaS companies, she was able to use her engineering skills to truly understand the products she was marketing and the pain points of her customers who were mostly engineers. Among many brand and messaging focused marketers working primarily with traditional channels, the term “product marketing” is somewhat ambiguous, especially given the increasing importance and relevance Product Marketers. In reality, product marketing does not operates independent of your other growth channels. In fact, it helps create more context around your campaigns and makes your other channels more effective. Product Marketing is a strategy that then can be applied to any channel – traditional channels or your new channels. Regardless of the channel, you still have a product and you still need to market it. There are many things that make marketing a product to consumers far less complicated. Lower priced product typically involve a far shorter sales cycle and almost always involve far fewer decision makers in the buying process. It’s very normal for anywhere from 25% to 75% of your product, your marketing efforts, and your sales efforts to focus on stuff that’s not core to your product. It may not core to the need, but is taking care of this compliance or security or custom requirements for an enterprise. Marketing to enterprises also relies on high level of personalization to meet legal regulations and fit into their existing business operations. It wasn’t long ago that businesses had tremendous trouble accessing data from their products and customers. That problem has since been reversed. The data we have available is now so detailed, that strong business intelligence is required to make sense of it. If you don’t do anything and you just go with the data put in front of you, there’s no guarantee if that data is right. You have to actually take effort to make sure that you get the right data and not just go with the data that is so easily available. Some of this data is even fake or irrelevant to specific businesses. Without the right business intelligence initiatives, it’s possible to dedicate attention to the wrong information. This is potentially worse than not looking at data all together. Ander: Continuing on with our roster of all-star marketers from Silicon Valley and beyond, it’s a pleasure to do this interview because I’m getting to interview one of my colleagues and actually my boss here at Instapage, our VP of marketing, Saranya Babu. Saranya, thank you for taking time out of your very busy day. I see your Google Calendar, I know how much you have going on, so thank you for taking the time to sit down with us. Saranya: The pleasure is mine. Thank you, Ander. Ander: Of course. So Saranya, it’s been very interesting working with you since we both started at Instapage because you have this very technical background that transitioned into what you now do as a marketer. And, you have been able to kind of create this synthesis between these bigger branding ideas and these technical product ideas. But, before we dive deep into that stuff, it would be interesting to hear a little bit about how you got to Instapage – the thirty second version of your professional journey. Saranya: Sure. I started as a software engineer. I have a couple of degrees in engineering and I started at a small company basically writing code. And then, I became an architect which got me exposed to customers and partners. As I had these conversations with my customers, the partners, and other industry players, it got me interested in the business side of things. I’m also an extroverted personality, so evangelizing your product to the market was something that really appealed to me. So I went ahead and did my business degree and transitioned to marketing. I started out with product marketing because that was the best fit for me, given my background, and started at companies where we were selling products to IT, basically engineers like me. I started at a place where I already understood the customer and I could understand the pain points and message to them really well. Ander: So just for clarity… The term ‘product marketing’ is kind of an ambiguous term for a lot of marketers out there that are exclusively focused on brand, or exclusively focused on where their advertising dollars go. For people like us who share that perspective, how would you define ‘product marketing’ specifically? Saranya: Product marketing is defined in different ways in different companies, but the way I see it is working with the two ends of your business, the first being your product and this other end being your customer. You’re taking these two ends and making sure that what you make, the product, is relevant to the customer and messaging it in a way that is useful to the customer and in a way that the customer can connect with. Bringing these two ends together is really product marketing, the way I see it. Ander: And, that involves pricing, that involves UX and a number of other things. Is that correct? Saranya: It’s very broad and in most companies, product marketers probably do a certain subset of the things that constitute product marketing. It’s got everything to do with what your product is, right? To coming up with what your product is, what the pricing should be, and how you should promote it to all of the channels. Ander: And that is, I imagine, why your experience as an engineer lent itself towards that so well? Saranya: As an engineer that went into marketing, I had a really good fit for three reasons, the first one being that I was initially selling to engineers and I understood the customer. The second thing is that I’m very analytical and at a certain point in my career, I had to step up and do demand generation in addition to product marketing. When I did demand generation, growth marketing, it was all about the numbers and the funnel so I got introduced to my best friend, the funnel. That was very eye opening. But it was such a good fit because I was already very analytical and number-oriented. The third reason why my engineering background was really useful as a marketer, especially in the past few years, is that marketing has now become a technology-oriented space. Previously, it was purely artistic and soft skill-oriented, but now there’s 3,500 companies in this new space called ‘martech’ – marketing technology. Ander: Is that how many there are now? Wow! That is wild. I feel like maybe ten years ago there were a couple of hundred for something like that. Saranya: Exactly. So as someone with a technical background, I find myself up-to-date and at ease in this new space with this new changing and evolving market. Ander: It’s true. Especially with the way that people are spending dollars online in terms of advertising and shifting away from traditional media. But, I think that there are a lot of marketers a lot of marketers don’t have these technical skills and product skills. I was certainly like this at one point when I first got into marketing. It might be something about technical SEO or maybe an understanding of how data can be used. In your experience, at your previous companies and even here at Instapage, what are some of the observations that you have made about the lack of skills people have in one way or the other? Saranya: What I’ve seen so far is a kind of a generation gap. There is a certain generation that grew up with the internet, that grew up with email, with social media, and with all of the devices. All of these technological advancements happened so quickly in the last twenty years. And twenty years is just one generation, so there’s a few generations that did not grow up in this paradigm. There is a huge split in the workforce. On on the one side there is this generation that grew up in this environment, that’s so at ease and that has a technical wiring. They don’t have to have a technical degree or a specific technical training. They’re used to getting into a Cloud-based app for everything; they have an app for everything. There is a device, they’re very comfortable, so they’re able to adapt to this very quickly and it comes to them naturally. There is another generation that did not grow up in this environment. They’re very used to very traditional means of communicating with people, traditional means of doing things, and traditional work-flow processes. Unless they have a technical background, I definitely find them lagging behind. There’s almost a lack of willingness to adapt to this new technology paradigm that we’re in, so they kind of fall behind. There are companies that are definitely a few years behind when it comes to marketing. Ander: So even though there are marketers within organizations who have these technical skill sets and of course there are going to be some marketers who have hired people with these technical skill sets to fill those gaps, what do you think the right balance is between paying attention to product marketing, to your pricing, to how a product is presenting itself to the user, versus more traditional channels – even something that might be mainstream media-oriented? Saranya: One clarification on product marketing… I don’t see product marketing as a separate channel but rather a way of messaging to your people. It’s all about the messaging, how you position yourself, how you price the product, and how you promote the product. That’s a strategy that then can be applied to any channel – traditional channels or your new channels. But regardless of the channel, you still have a product and you still need to market it. Ander: I think that one of the confusing parts about product marketing is when a company has someone running their paid channels, someone running their SEO, social media, content marketing, etc. And then, they also have a Product Marketing Manager. Ander: That’s why I think that some marketers see them as these separate buckets. But, I totally agree with what you’re saying and how they ultimately all feed into the same thing. Saranya: Right. The way I see product marketing is the person looks at the product and identifies how to message this product to the customer. They try to understand who the customer is, who the different buyers are, the customer journey, and all the different influencers within the organization. They work to understand their pain points based on some research and understand that, and then based on that, come up the messaging. How do we want to position the product? Do I want to cater to the rational benefits or do I want to talk about the emotional benefits for this particular audience? Maybe it’s a combination. Once they come up with that framework, then the managers of paid marketing, SEO, and all of the other channels, can take this and then package it for their specific channel. Ander: You don’t necessarily have to go more one way or the other. Ideally you should be providing as much attention to product marketing as everything else and using that information in the same way. Ander: You said something interesting about looking at the right person and creating the right message for the right type of audience. This is especially relevant to the next thing that would be really interesting to talk about – enterprise marketing. Ander: It’s obviously very different when we’re marketing a product towards a consumer or towards a more consumer-oriented audience instead of a Fortune 500 company, especially when it’s an IT product or a technical product, something perhaps like Instapage or Salesforce. What do you think is especially different about marketing towards these enterprise solutions, especially when you’re looking for a contract that’s $500,000, or even millions of dollar per year? Saranya: That’s a great question. Enterprises are a totally different animal. There is no standard definition of what an enterprise is in terms of size of employees or revenue across the industry. But let’s just assume we’re talking about significantly large companies with huge revenues. There are certain things that make them very different from, the mid-sized or other companies and they’re also very different from consumer companies. B2C marketing is very different. There are some major differences. The first one would be that enterprises have very huge budgets, so almost always the budget is never an issue, unless we’re talking about multi-million dollar deals. But in general, the budget is never an issue. Secondly, because they have such huge revenues, they also have such huge assets and infrastructure which requires very high security and compliance requirements. The larger the enterprise, the higher or the more stringent these security and compliance requirements are. The third thing is that they already have a successful business happening so the cost of any disruption is very high. They are very particular about business continuity and they already have an existing infrastructure, so any new solution that comes in has to integrate with the existing infrastructure. And because they have so many requirements, they either build the products in-house or they get very customized versions of products that exist in the market. Ander: Yeah, I mean, I can think of a few companies that have built their own content management systems, among other things. Saranya: Yeah, they just can’t find anybody who would satisfy all of these requirements. Also, if they’re in a highly regulated industry like the finance or government, they will have even more requirements. Ander: And, as you know, one of the things that we talk about a lot here at Instapage – and marketers are talking about it everywhere, quite frankly, is personalization, which is this vague, ambiguous term that can mean a number of things. We talk about it here in the context of advertising personalization. When you’re marketing to enterprise organizations you have to give a lot of attention that has to go into their very, very specific needs that really only apply to what they do internally. How do you balance this level of personalization to one company while still maintaining a broad value proposition that’s going to allow you to market to other companies? Saranya: This is a great question. Because enterprises are large and have a lot of people, the sales and the marketing process are very complex. With a small startup there are only two people that you need to convince. An enterprise is going to have possibly fifty people. You may want to find out who the champion is by talking to a few people and identifying a champion within the organization. And then, you also have to help them then navigate the whole sales and buying process. You have to help them make the business case to their management and all of the other departments who are part of that same infrastructure because their business continuity is really important and you can’t really disrupt anything. And there are many, many approvers and many, many influencers within the organization. You have to help your influencer make the business case to all of these people, help them navigate the purchasing process, help them navigate the IT and the legal requirements. That makes it a very, very complex sale. That said, if you are doing enterprise marketing, one of the highly recommended ways to do it is account-based marketing. There are only a handful of very large companies and if you’re looking at enterprises, you may want to start with a list of accounts that you want to target. It could be a Fortune 1000 or a pharmaceutical company that has a revenue of more than $1 billion. It’s very easy to then go into the account and get a list of all of your influencers, decision-makers, and the titles of the people you want to target. Then you can do a combination of targeting via account-based advertising, and targeting ads on Facebook and LinkedIn to just people from those accounts. You can actually customize your message to that account. Almost all enterprises have the same high level needs in terms of business continuity and security compliance. But you can customize it a little bit further. For example, if it’s Microsoft, then you may want to talk about how we can help your Cloud business and customize a little based on what their product is and who they’re targeting. If it’s a B2C company, then you can talk more about how they can get more consumers and their pace. Account-based targeting and account-based marketing would be the way to go. Ander: When you refer to these influencers, I imagine you’re referring to the people with purchasing power. These are going to be the CMOs, VPs, and CEOs in some cases. To what degree are you also referring to the individual contributors or perhaps mid-level management? The people who are actually going to have their hands on the tools themselves? Saranya: An influencer could be anybody, so it could be someone in the management but it could be teammates too. Often the influencers are people in the team, or the people that work in the other departments. Often they are individual contributors. The management comes in mostly as approvers. They either have an approval authority on budget or they have authority to approve based on IT or legal requirements, so they’re mostly approvers. They’re not really the influencers. Ander: I read this article about a year ago about how Slack became what it is now. They had a bottom-up strategy where they got all of the individual contributors, the smallest people at the companies, to get on board with the product. Before you knew it, management had to start using it too. Do you think that in some cases maybe that’s not an effective approach? Saranya: It really depends on the project or the specific use case. If you have a product that has a network effect that makes you sticky, get as many users as you can and then become so sticky that at that point the cost of switching over is high. But it’s different if you’re looking at a very strategic initiative. Let’s say there’s a new CMO and they have the goal to double revenue. At that point, this person is going to come up with some strategies and some goals that they delegate that out to a director-level person and tell to to implement account-based marketing. And then they go to the communications team and tell them to build a community for their users. They would have a list of things at a strategic level and then they delegate that out to their next line of direct reports. The director-level person then comes up with a strategy and those requirements. They may actually delegate the product evaluation or the feature-based evaluation to someone on their team. The strategy flows from the top so the decision on a certain product would probably lie still with the person that’s evaluating the product, it might not be the individual contributor or the director. But yeah. It’s often the flow that I see. Ander: We’ve talked a lot about enterprise, and a lot about B2B. I know that is your primary focus. But from your perspective, is there anything that consumer-focused companies companies can take away from enterprise marketing strategies? Saranya: Well, there’s a lot that B2B companies can learn from B2C. Haha. Ander: There certainly is, yeah! Saranya: B2C is a very different beast. You are producing a product that you want to mass market, so you want to push it out to everybody. Often they are lower-price points that do not justify a sales force. One of the exceptions I can think of is car sales, where the price of that product is so high and it’s such a touch-and-feel type of product. Saranya: Real estate as well. In that cast you can afford to have agencies. The cost of the product is so high that it makes sense to have agents, middle-men and salespeople in the mix. Ander: Yeah, that does make sense. Where do you think all of this is headed? So many things are changing so quickly in the marketing technology space and the enterprise space as a whole. And this is happening on both a micro and a macro level. What could we expect in the future of enterprise marketing? How are things going to change? Saranya: I’m going to talk about marketing in general. To make it easy to consume, I’m going to call it AI, BI, CI, and DI. Technology has changed so fast in the last twenty years including technology to replace some of the work that was done by humans. I see that happening at a much faster pace as we go forward. We’re going to have more artificial intelligence, or AI. I see that completely taking shape and becoming a really big thing and more mainstream in the next few years. We already see a lot of products that have come out. Anything that is repeatable, learnable, and replicable will be replaced by some kind of an AI technology. Humans have to reach to those extremes of your brain that really cannot be replaced by a machine, so in future jobs, you know, that’s something for the future generations to keep in mind. That’s the first round. The second one is the data. There was a point a few years ago when it was hard to just get data. Now the problem has flipped and we have so much data that we’re actually spending more time than we used to before when there was no data. We’re spending so much time just sifting through the data and then figuring out what is good data, what is bad data, and what’s fake data. There is a lot of fake data as well ander it needs to be filtered it out. We also need to filter the irrelevant data because not all data is relevant to us. For example, I could go to Yelp and I could look at the ratings on a certain dish, but I can’t just assume that that would be the best restaurant to go to. I have to then go into the 200 reviews and read about it because some of the dishes may not be to my specific taste. I’ll have to do a lot more research to then filter out those reviews that are not suited to me to then find out if that’s really the right choice for me. Ander: And that, in this case, is BI. Saranya: Yes, correct. Business intelligence. I think companies would be investing, or would have to invest in, business intelligence to really sift through this whole data proliferation, to mine some information, and to make sure that their business is going in the right direction. If you don’t do anything and you just go with the data put in front of your eyes and if you just go with it, there’s no guarantee if that data is right. You have to actually take effort to make sure that you get the right data and not just go with the data that is so easily available. The third thing is the CI, which is consolidation of the industry, especially with the ‘martech’ industry. There are 3,500 companies in this space. It has grown so fast. At some point, this has to all consolidate. Some companies will drop out of the race, some companies will make it, and others will just merge or be picked up by some of the bigger companies. This is something that has happened to every single industry, starting with hardware and manufacturing. They all start with many, many different players, with different offerings and different products. At some point, more and more of what they offer becomes commoditized and there’s not much differentiation. At that point, they have to consolidate and then come together. And the last one, the DI, is direct interaction. With the advancement in targeting technologies, we can now target people based on their specific behaviors, based on the demographics, based on so much information that we never had before that online interactions. At first online interactions were basically created for low-touch, high-volume, at-scale type of interactions. For very high-priced products like a car you can have a one-on-one, like, salesman type of interaction. But for most products that are mass-produced, the reasonable and affordable option is online interactions. Originally, online interactions were not really customized; they were one size fits all. But with this technology advancement, we know exactly who you are and what you’ve done. We can now tailor your online interaction and personalize it so that it comes as close to a direct interaction as possible. It’s almost as good as sitting in front of a person and talking to them face-to-face. It’s really about personalization and the technological advances there is going to make our online interactions as close to direct interactions. Ander: Given all of this, what do you think we as marketers have to keep in mind as we move forward in our careers and as we scale and grow our companies? Saranya: I think the one important thing for marketers is really to break through the noise, as you always put it. I think, again, it plays into the personalization. For everything you think is unique about your product, there are ten other products out there that claim the exact same thing and they probably claim that they’re better than you. Ander: And, it’s also not just about having that unique value proposition. It’s about saying it in the right way and getting it to the right people. Saranya: Exactly. How do you find that space that is your own which nobody else can claim? If there is no such space, then you should probably go back and think about why you’re in business because you won’t survive for long being that kind of company. You have to have that niche that’s yours, and this has to happen from a product standpoint, the messaging standpoint, your sales process, and everything else. Messaging is really important. It has to be fresh, it has to be refreshing, it has to connect with the user, and it has to be different from how other people are talking about themselves. People get conditioned. They browse so many websites these days that they get conditioned to ignore things they keep seeing that are repetitive. You will not stand out if you don’t differentiate yourself in terms of messaging, in terms of product, and in terms of everything you do. Ander: Well, I’m very hopeful that throughout the course of this podcast, Advertising Influencers, and speaking with people like yourself as well as a number of the other marketing thought leaders that we have on, that we will hopefully help our worldwide listening audience get closer to being able to do that more effectively. And that goes with the rest of the content that we produce here at Instapage. Ander: Saranya, it has been a pleasure talking with you. Thank you so much for taking time out of your busy day to sit down with us here on Advertising Influencers and I will probably talk to you very soon. Saranya: The pleasure was mine. Thank you, Ander.